It’s hard to have a crappy dinner at the top of a revolving restaurant with 360-degree views of Berlin. Not only is the food fantastic, but you don’t even feel like you’re spinning around. Let’s face it, that can never be a bad thing. The Fernsehturm, near Alexanderplatz in central Berlin, was completed in 1969 and is the tallest publicly accessible building in Europe. The restaurant is aptly called The Sphere and conducts two full revolutions every hour. This is slow enough that you won’t lose your dinner and fast enough that you might get a few spins of the city while you’re eating. The Reichstag is an imposing building with a wonderful glass dome perched on top. It’s one of the most visited attractions in the city and the dome offers 360-degree views over the city. Germany’s 7th largest city has reinvented itself as a Mecca for tech and media businesses. The newly developed harbour, sitting on the banks of the Rhine, has a swathe of funky buildings and several rooftop bars that are perfect for chilling out and taking in the city lights. Düsseldorf Old Town is such a beautiful place to casually wander around and occasionally stop for coffee or beer. The buildings are quite stunning and the open space and pavement cafes really add to the relaxed atmosphere. It can get pretty crowded at weekends but is rarely rowdy. A small part of Allstadt faces the Rhine (Burgplatz, for example) and the views across the river and towards the Rheinsturm TV Tower are pretty special. Innside hotel and bar largely looks like a crane and is a colourful and very unusual building. However, with it being based in the MedienHafan (harbour) area, unusual is normal there. The hotel sits across the Rhine from the wonderfully squint Neuer Zolhoff buildings, and more than holds its own in such esteemed company. The Twist Bar in the hotel is *the* place to go for romantic views of the Rhine bridges and twinkling city lights. The cocktails are pricey, but you’re so worth it. Munich is the capital of Bavaria and located in the Southwest of Germany. It’s perhaps best known for its annual beer festival, as well as the infamous beer hall putsch of 1923. Odd how these things are both connected by beer… Anyway, Munich is the 3rd largest German city after Berlin and Hamburg and has around 1.5million residents. At the heart of the city centre lies the beautiful town square; Marienplatz. The square has two town halls; the New Town Hall (Nueus Rathaus) on one side and the Old Town Hall (Altes Rathaus) on another. The beautiful glockenspiel on the New Town Hall is a reason for visiting Marienplatz on its own. Several times each day, it performs a 16th-century story, which includes a chirping rooster. What more could you ask for? This former Royal Palace previously housed the Dukes of Barvaria until 1918. It also served as the seat of Government for the region. Much of the Residenz was destroyed during WW2, but it’s since been restored to its former glory. These days it houses one of the largest museums in Bavaria. As well as the Residenz, there’s also the Cuvillies Theatre and the Treasury on site. The building itself is spectacular and there are also extensive grounds and courtyards that can be visited. Like Dusseldorf, Dortmund is located in the North Rhine Westphalia region. It’s known, as are a lot of German cities, for its love of football and beer I have a personal friend who is Dortmund crazy and I’m aware that the Westfalen Stadium, where Borussia play has an actual pipeline beneath it that pumps Veltins to thirsty supporters. Football and beer? Sign me up! This is a telecommunication tower and a popular landmark in the city. It was constructed in 1959 and has been improved and renovated several times in its lifetime. Florianturm stands at around 220 metres high and has two observation decks (including an outdoor viewing area) and a revolving restaurant. Located within Westfalen Park, the tower was originally built as an attraction for a horticultural show. This pretty building was formerly a brewery (what a shock…) and has now been transformed into a creative arts centre. Due to the large letter ‘U’ stuck on the roof, it’s an easy building to spot. The building is used to display art from the 20th and 21st Century. Within the building is the Museum Ostwall, which was relocated here in 2010, and shows a collection of wonderful works, some of which were previously classed by the Nazis as ‘degenerate art’. If that doesn’t make you want to go, I don’t know what will. Amongst the collection’s highlights are works by Salvador Dali, Joan Miro, Marcel Duchamps, as well as a host of graphics by Pablo Picasso. Situated in the Old Town, the Alter Markt was the old market square in the heart of the city. It’s a traffic-free area, which houses a beautiful old fountain and the Altes Stadhaus. The Stadhaus is the old market building, which is a popular shopping area, with numerous cafes, shops and galleries. There’s a large eagle on the façade of the building, which represents the city of Dortmund. The building is neo-classical in design and has striking red/orange brickwork. 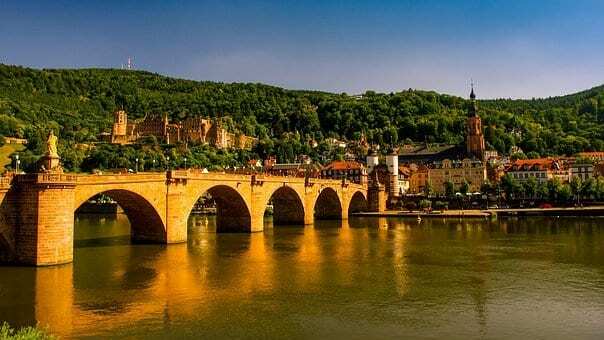 Heidelberg is one of few cities not destroyed during WW2 and sits in the Southwest of Germany. It’s very much a small city but has a large percentage of students amongst its residents. This is largely due to the fact that the city has a University. Heidelberg is the location where Mark Twain finished his novel ‘The Adventures of Huckleberry Finn’. The Old Bridge (also known as the Karl-Theodor Bridge) runs across the Neckar River, connecting the north and south. The bridge is constructed from sandstone and was built in 1788 At one end of the bridge, there’s a rather fabulous monkey statue. The current statue has been in place since 1979 and was designed by Gernot Rumpf. The cute monkey has a mirror in one hand and is making the sign of the horns with the other. The sign of the horns is pretty much the hand gesture made by fans of hard rock bands. Clearly, this is one funky monkey… Anyway, there’s a sweet little poem beneath the statue and it’s a pretty sweet sight. It’s not every day you see a monkey on a bridge, is it? The ruins of the castle, although still quite beautiful, have been standing since around 1214. Perched on Konigstuhl Hill, the castle looks out over the city below. It has been termed the ‘Eighth Wonder of the World’. That’s what the guide told me, so who am I to argue? Joking aside; it is absolutely stunning and holds a spot on Germany’s list of National Monuments. If you ever wanted to that whole ‘Cinderella’ thing, THIS is where you’d do it. Have you been on any romantic German city breaks?